"We've got to get back to talking to our neighbors and having real dialogue with one another," said the leader of a black law enforcement organization. 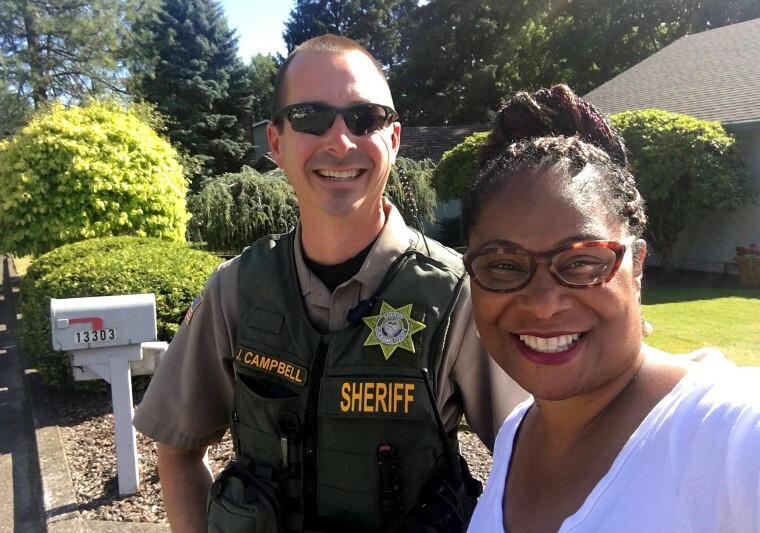 It all ended amicably — the lawmaker, state Rep. Janelle Bynum, even took a smiling selfie with the sheriff's deputy who responded and received an apology from the woman who called 911 — but the incident just added to a growing list of the police being called on black people doing ordinary, nonthreatening things. What happened to Bynum "just took it over the top for me — you can't even go door to door without having police called," said Clarence Cox III, president of the National Organization of Black Law Enforcement Executives, or Noble, which advocates for justice in policing. While that misunderstanding was cleared up quickly, it's "not a case of all's well that ends well," Cox said. While some police departments are now using these cases as models for their officers in how to best handle calls rooted in perceived bias, Cox said it's also imperative that dispatchers, police and citizens become more aware of how these complaints differ from actual criminal activity and to prevent them from escalating into something far worse. "We've got to get back to talking to our neighbors and having real dialogue with one another," Cox said. "If we continue going down the path that we're going, we're going to be one shot away from a civil war." The people who have called 911 have often been identified as white, although not always (Bynum said she didn't know the race of her caller). Cox's organization has called for mandated implicit bias training at police agencies across the country in light of the high-profile cases of police-involved shootings of unarmed black men. "The officer has to have the info to know it's not a hot call," Cox said, referring to a situation involving an active crime scene. He added that officers, when they arrive at the scene, also need to be trained in how to best mediate during a tense situation. He added that it's important for people — before they dial 911 — to think about why they're doing it and if the situation can be resolved with a simple conversation. These incidents are often captured and shared on cellphones, helping to spread people's stories, and Butler said that might be a good thing. A cellphone video of police officers in Abbeville, Louisiana, has been viewed on Facebook more than 384,000 times since it was posted June 23. Police found themselves in a delicate position when they were called to remove a group of black patrons from the parking lot of a Chili's restaurant. "Why? Why?" one of the men asked. "Because we're black people in Abbeville it's [an] altercation." In the end, no arrests were made and the group left the parking lot. Chili's later put out a statement saying it regretted what occurred. "The officers didn't have to make an arrest," Spearman said. "I’m actually proud that with things going on in our nation that's how they responded." Mark Bentzel, the police chief of the Northern York County Regional Police Department in Pennsylvania, said he's using an incident in April as a "learning tool" for best practices after his officers were called about a group of black women who were accused of golfing too slowly at a golf club. In the case of the women at the golf club, they wanted police there as well to get their side of the story. That worked in the officers' favor, Bentzel added. "This is the tough part for law enforcement — we've always been used to help mediate these type of situations. It doesn't matter if it's a golf club or a restaurant or a bar," he said. "With just a slight twist of decision-making one way or another, things might turn out worse."